Knight's Early Black is a traditional English early-season black cherry. The flavour is well-regarded, and the tree is reasonably problem-free and productive. Please fill in the details below and we will let you know when Knight's Early Black cherry trees are back in stock. Penny is a high quality very late-season black cherry - it ripens in mid-August. 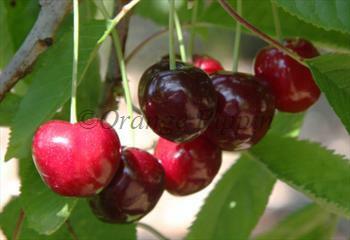 Kordia is a large late-season true black cherry variety with a good balanced cherry flavour. Use / keeping: 1-3 days? Knight's Early Black is in flowering group 3. Knight's Early Black is self-sterile and needs to be pollinated by another tree of a different variety nearby. Since it flowers in the middle of the blossom season it can be pollinated by most other cherry trees. Knight's Early Black is self-sterile and needs to be pollinated by another variety which blooms at the same time and is in the same incompatibility group - the simple answer is to plant a modern self-fertile variety nearby, such as Stella, but Van and Amber Heart are also options. It is likely that Knight's Early Black was raised by T.A. Knight at his orchard near Elton, Herefordshire, in the early 19th century. It achieved some commercial success particularly in Kent, and there are probably several forms.